Advent Calendars by the Bushel! What a great time we had yesterday making Advent Calendars! Morgan, Shannon, Kayka, Correna-Lyn and I had a lot of fun and even managed to recruit my husband, Dwayne, to cut boxes for us on my Cricut so we could all work. I had them set up in the Cricut Craft Room so that I could get two boxes and one greeting card from each sheet of cardstock. He also cut out snowflakes for us! Have I created another crafter?? I doubt it, but it was great to have his help! There was paper all over the table and the floor, but no one ever said creativity was neat and tidy!! As you can see, we were using my dining room since my craftroom is not quite complete yet. Hopefully it will be ready for my next workshop in two weeks! We will be making Christmas cards and that can be even messier! Once the dust settled, we ended up with five beautiful calendars! Morgan got to day 15 and had to leave. But her calendar is looking fantastic! She stamped everything she needs and took it home to finish building. Shannon and Kayla both got theirs finished!! Way to go ladies!! These are truly beautiful! Correna-Lyn got to December 23 and had to leave. She stamped what she needed to finish this at home. Great job, Correna-Lyn! Mine is on hold at day 16. I started making the calendar according to the Workshop on the Go kit but decided I just didn't like it, so I am taking the boxes from the top row and moving them around. Day 4 became Day 24, and I will mix up the others too. And I prefer the smaller numbers (from the Trinity Alphabet set) so will be changing the larger numbers for these. All in all, I am really happy with what I have so far! What do you think? Partridge in a Pear Tree, or Pear & Partridge in a Tree? I added some of our glitter tape to one and sanded the edges of another. Glitter tape again. Love that stuff! Card #1 - The one on the right is according to the WOTG. I hope you like my take on the cards. I had fun changing them up to be my own. There are still three seats left for the Christmas card workshop on December 8! Call me and pay for your kit by November 15 to reserve your seat! Thanks much! Now that Fall is upon us and it is starting to get too chilly outside to do much, it is time to start thinking about getting caught up with the scrapping! I know, I know. You don't have time at home to sit and work on paper crafts. There are kids, hubby, pets, and a ton of other stuff that HAS to be done because you are home. But guess what? It will still be there tomorrow if you take a much needed day for yourself today! Better yet, delegate!! I LOVE that word! Tell the family you are taking a ME Day and that A will be in charge of XYZ, B is responsible for ABC, etc. It is amazing how much gets done without you! So to honour OURSELVES and let the rest of the family have some responsibility for a day (or two...), I have created a few Saturday workshops for your crafting pleasure! Each workshop will be from 9:30 AM to 4:00 PM, and includes lunch, snacks and beverages. I will also have a few door prize draws! And if you bring a friend to help you or who purchases their own kit, you will get an extra entry into the draw for the BIG prize! I'm keeping that one secret for now! Payment or order by cash or credit card is due at least two weeks in advance to save your spot. Each workshop will cost $35.00 and include all supplies, lunch, snacks and drinks! The workshops can be ordered through my website or through me. If you order by yourself through my website, the cost of the workshop itself ($5) can be paid at the time of the workshop. I will have orders set up in the bottom right of the page - just pick the one you want and make your order. Saturday, November 24 - Christmas Advent Calendar. This beautiful Advent Calendar could be used for so many other things! Although the calendar in the Idea Book is beautiful, I am changing it up some to make the workshop less expensive for YOU! We will still use the My Creations Cubby, but I am making my own kit making this workshop only $35! Deadline for ordering - November 1. Saturday, December 8 - Christmas Cards! Close to my Heart has made it so easy this year by offering a gorgeous Christmas Card Workshop on the Go! 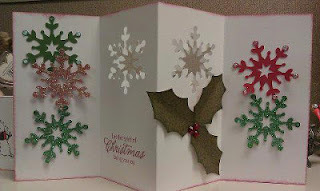 It is shown on page 66 of the Idea Book and includes everything you need to make 15 beautiful Christmas Cards! I love this kit and can hardly wait to get my hands on it! Deadline to order - because this is likely to be popular, November 10. REMEMBER - order early to make sure you get the kit you need! Order through me personally by cash or credit card, or online at http://janmccormick.ctmh.com by credit card. I am really looking forward to these workshops! And I am REALLY looking forward to seeing you there! Oh, I do love stamping! I want all of them! And every colour of ink too! There is so much that can be done with our stamps and it seems every time I log in to Facebook, someone has raised the bar a little higher. Nicole Robinson turned the family tree stamp upside down and it is now a pumpkin!! Ingenious!! I would NEVER have thought of that!! So, on to the techniques we learned about at regionals. So simple and so pretty! Base and Shade Stamping: Who has stamped with the Love Blooms set? Then you have done base and shade stamping! Easy peasy! This set comes with a base - the outline - and a shade - the fill - so you can create some gorgeous images. Here, I used Ruby for the base and Smoothie for the shade. Love it! Stamp Kissing: I have never had luck with this technique. I tried it with a couple of different stamps and this is the best I could come up with. Selective Inking: Sort of like selective hearing but better! You will need a few daubers or small pieces of sponge for this one. Decide the colors you want but not too many or the image will just look muddy. On my image from the Friendship Bouquet, I used Saddle, Autumn Terracotta and Olive. Okay. It was just like convention but smaller. A LOT smaller!! Not sure how many there were, but I think it was around 150 or so. And 150 women can make a lot of noise! We started out Friday with a keynote address from Monica. She is such a sweet lady. We learned more about her and her family, how she started with Close to my Heart (DOTS back then) and how her career at Close to my Heart was definitely meant to be! I still find it hard to believe she has seven kids!! She looks absolutely amazing!!! "It's time to Photoshop my life: touch up the edges, _____________________, blur out the background, and focus on me." I think as women, we tend to think of others first and then take care of ourselves later, sometimes too late. We need to think more about ourselves too and take time for us. 1 - The chance to attract non-papercrafters to Close to my Heart! There are a lot of people out there who prefer not to scrapbook the traditional way, and don't do any other paper crafts either, but they still have a ton of photos that are sitting in boxes. This is our chance to show them how to scrapbook those memories using Studio J. 2 - We can assist the die-hard scrapbookers to keep up with their scrapbooking. Let's face it. Traditional scrapbooking takes a lot of time. But you can create the same layout in Studio J in about half the time! 3 - Portability!! As long as you have an internet connection, you can work on your Studio J layouts! Some of the barriers to using Studio J? 1 - Getting comfortable with technology. Some people think "computer" and shudder! We need to show them that there is nothing to fear! 2 - Internet speed and access. Unfortunately, some people live in places where they don't have easy access to high speed internet. Can we hold Studio J workshops in our homes if we have high speed access? Or meet at a local coffee shop that offers free internet access for an hour to share ideas, work on layouts and just have a good time. Brian also spoke about Party Magic! He stressed that gatherings and clubs are about DOING rather than WATCHING. Anyone can sit and watch a demonstration, but they don't really learn anything until they actual try it themself. Hostess Rewards are important and if your customers are allowed to DO rather than WATCH, they feel a sense of accomplishment (Honey, look what I made tonight!) and walk away feeling creative! They also have the structure to help finish and get a sense of community and connectedness. Then they are more like to make a purchase and your hostess will be eligible for her Hostess Rewards! Kristine told us some interesting facts about our stamps. I never knew this, but all of our stamps are made right at the CTMH head office! They are made of the highest grade of commercial-grade polymer, and 100% produced in North America. And we all know they are easy to use, store, clean, transport, and reuse! 1 - Play favourites - if you have a favourite stamp set in the current catalogue, tell everyone about it. Tell them WHY it is your favourite. 2 - Start smart - if someone is starting out with stamping, sell them an alphabet stamp set. They will get more use out of it and will come back for more! 3 - Show it to sell it - speaks for itself! 4 - Focus is fabulous - pick a paper pack for a gahering, workshop, or club, and focus on the stamp sets that co-ordinate with it! BUT (there is always a BUT) keep the selection to three or four to avoid overwhelming the customer. Next, Kristine showed us some great techniques to give our paper crafts that pop! I am going to do these and photograph them, then post on another blog post, so keep watch for that. My favourtie was the Cricut Business Class. I love my Cricuts (yes, I have two - the original and an Expression) but don't get to use them nearly as much as I want! Amy from CTMH explained how to use some of the fancier buttons on the Expression machine, and I am SOOO glad she did! I am going to try them out! LOAD LAST - if you cut a design on your paper and then want to take your cut images off the mat, but still want to cut something else in the same colour, relod the mat using LOAD LAST instead of Load Mat and the Cricut remembers where it ended and will go to that spot! How cool is that!!! MIX AND MATCH - Use this key if you want to cut various images from different keys on the same paper. Press Mix & Match key, then select the first accent. Then select the second accent, and press cut. Not sure if you can do more than two but I will try it and let you know. FIT TO PAGE - press this key to get the largest image you can that will fit on your paper. If your paper is smaller than 12" by 12", you need to place it in the bottom left corner of the mat, move the blade to the top right corner of the paper and press Set Cut Area so Cricut know how big the paper is. CENTER POINT - I am SO going to try this one! If you want to add a window to the front of a card, place it on the mat oriented so the cut will be correct, and move the blade to the center of where you want the window to be. Press Center Point and then enter the measurement. Make sure you enter the whole measurement and not just half! Cricut will determine where it is and cut accordingly! FLIP- gives a mirror image of what you are cutting. This would be great for something where you want mirror images of something but you want the paper the same for both. Instead of taking one image off, flipping the paper and recutting, just use FLIP! SETTINGS - did you know you can set different cutting increments on your machine? You are not stuck with 1/4" increments!! You can also change other setting in here but I have not played with them yet. 1 - Press MAT SIZE and tell Cricut your mat is 24". It doesn't know differntly so go ahead! 2 - Place the leading edge of your paper (the edge that goes in the Cricut first) inside the non-cutting area (make sure it is inside the cutting area), and load it. 3 - set the size to 13". You will get a 12" border! 1 - clean it well with soap and water to get all the old paper (and what ever else is stuck to it) off, and let it dry well. Apply a thin coat of Bonding Memories glue and let it dry. 2 - Clean it with Dawn dish soap. No need for anything else. Several ladies swear by this and say the mat is sticky again when it dries, but only Dawn works. Hm. Who knew? I am going to end here as my hands are getting tired from all this typing. Also the rest of what I want to say is creative stuff and I want pictures too, so once I have it all done, I will post another blog. In the meantime, here are some photos from the Edmonton Regional Celebration! Sue, Lisa, Marguerite and Kelly. Stitch comes to all CTMH events! Monica greeting us and presenting her keynote address. Was Brian chatting on Facebook? Naw. He must have been working. Right Brian? Some of the amazing artwork created by one of our very talented consultants for Extravaganza at Convention. The Q & A session that yeilded so many answers to consultants' burning questions. My upline, Sue Wilde. She is one of the sweetest, most helpful people I know! Angelique having fun with our My Creations Frame. The mini-album pages are a dimensional elements sheet that comes with the Cricut Artiste cartridge and the cartridge is used to cut the corresponding paper. LOVE, LOVE, LOVE this cartridge! Where it says "Convention STamp Set", this is the set we all received at the banquet. If you know someone who can lend it to you or is willig to sell it, you will be able to finish these pages. Otherwise use another stamp set that is similar or change the look altogether! The projects are found at Convention 2012 Projects. I hope this link works for everyone! It is in Google Docs. If there are problems, please let me know! Day 2 - It's HOT, HOT, HOT! Wow! What a day! The AC is cranked and I am freezing, but the topics today are as hot as it is outside! Cowboy Andy once again sang for us and then Monica had all of the directors of various levels on stage to do the Scrapbooking Boogie, which was sung by none other than Cowboy Andy! They each introduced themselves as they left the stage and then I realized just how many directors we have!! Kristine gave us a run down on Operation Smile and the Make a Miracle Challenge. Last year, CTMH consultants of all levels raised $70,000 for Operation Smile! This year, during the Make a Miracle Challenge, the top five finishers collected over $18,000 between them in that one month! Now is that amazing or what? The winner of the challenge who will participate as a non-medical volunteer on a medical mission, will go to the Philippines, where Operation Smile started 30 years ago! And the lucky winner is Kelly Hammond! She was overcome with emotion when told that she had won this fantastic opportunity. Enjoy the time, Kelly, and tell us all about when you return! Another amazing woman is Katy Carlson (I hope I got the name right) of Virginia. She, along with three friends, organized a crop to raise money for Operation Smile, and in one day raised over $11,000!!!!! To show their appreciation and admiration, Monica and Kristine are going to hold a crop for Katy, her three friends, and all of her customers! I imagine uplines and downlines are included in that too. Stacy Julian of Big Picture Classes was our keynote speaker at General Session this morning and passed on some excellent tips to us. Stacy is an amazing speaker and had us laughing, crying, and totally enthralled! Once she had traded hats with Dr. Phil and shoes with another consultant, she passed on some words of wisdom. Our own personal perspective is what makes our photos priceless! Leave the guilt and obligation outside! Do your own thing and don't worry about it. Events and everyday moments are really about the people experiencing them, so make sure to take pictures of the people enjoying the event and not just the event itself! Scrapbook the people and their personalities! The story you are most qualified to tell is your own! No one else knows it so make sure you share it! In other words, JOURNAL!!! Cute matters! Make your personal area your own! Add your favourite colours and things to your space. She then showed us a video by Hillary Weeks, called Stand Still. By the end of it, there wasn't a dry eye in the room. It was funny, sad, beautiful and just downright moving. Thank you, Stacy, for a wonderful and eye-opening presentation. When we broke for lunch, the DH and I went for a walk outside once we had eaten. As I said, it is HOT here! And the humidity makes it hard to breath. But the grounds of this beautiful hotel are gorgeous! I couldn't resist this little guy! He kept scratching at the ground and then rolling around. So cute! The Koi Pond. Anytime someone comes close, the koi come swimming up, mouths gaping, looking for food! Okay, Carol, Labuski, here is our new convention bag. It is HUGE and has a shoulder strap as well as straps so it can be worn like a backpack. Inside are two pockets - once slash pocket and one big zippered main pocket. It also has a pocket on each side for a water bottle or what ever else you need to carry. Waiting for the afternoon session to start. After lunch, we all attended a Studio J business class presented by Brian Holman. WOW!! No more memberships! Can you believe it!? That means no more members-only kits and patterns! AND all users will now receive jpg files with their layouts, or they can purchase the jpg files as standalones for only $2.95! AND instead of the 7-page minimum we used to have in Canada, it is now only 4! BUT there are no more free page protectors. I can live with that. Page protectors are inexpensive, especially when you buy the 50 page bulk pack at around $16. Next, we were off to the fourth Create and Take where we worked on this cute little mini album. As you can see, the place was full! We were all working hard to finish this fun project. Me and my buds! Sue, Peggy and me as the Dallas Cowboy Cheerleaders! What a day! General pandemonium followed by General Session (just another form of general pandemonium)! Waiting to enter the Chantilly Ballroom for General Session. Jeanette Lynton said a few words and put everyone's fears for her health at ease with news that she is overcoming the anxiety attacks she has suffered the past few years. So good to hear! Jeanette Lynton. I was too far away to get a good picture of her on stage so this is the big screen on the wall. Here we are! One missing - Kelly - because she took the picture. From the left are Angelique and Stitch, Sue, Peggy and yours truly, all wearing our shirts Angelique made for us and our pink cowboy hats! Then Monica, Kristine and Brian took to the stage to pass on the information that those of us who had attended Leadership Day received yesterday. Brian, Monica and Kristine imparting their wisdom to all of us. Finally, the fun REALLY started! Suddenly a noise is heard and a CTMH staffer runs on stage to say that J.R. Lynton has been shot! Oh no! Enter Sheriff Brian, who must interview all the possible suspects to find out who shot J.R.! All these four have done is bicker and keep their crafting secrets from each other. They also introduced the WOTG Scroll Album Kit - SOOOO cute!!! In the SHOOTOUT AT THE CTMH CORRAL, we were introduced to our new ALCOHOL markers and pigment ink pads!!! And a big announcement that we have all wanted - bulk paper is now available in ALL colours!! We were then entertained by the DALLAS CTMH CHEERLEADERS who performed with their new Organizers pompoms!! These are going to be in my craft room before too long! THE GAMBLER introduced us to the biggest and best news yet! We have another Cricut cartridge!!!!! It is called Artiste and again has 700 images! WOOHOO!! And guess who won the new set?! ME!!!!!! I couldn't believe it! By now, Sheriff Brian still had no suspects and decided to get everyone together and grill them. Just then the CTMH photographer came out and explained that J.R. Lynton hadn't been shot shot. She had been at a photo shoot and had been shot with a camera!! Our convention bag with the new Idea Book was handed out as we left General Session, and it was packed with all sorts of new product we would need for the Create and Take sessions! 7 new stamp sets, a new ink pad in Slate, paper, ribbon, and embellishments galore!! The Create and Takes were so much fun, but by 4:30 I was so cold I could hardly move so I packed up and came back to my room. Tonight is the Mix and Mingle, and I will be heading down there shortly. Tomorrow, I MUST take more pictures!! !